I bought the RT brand new in Spring 2011 from Cannon BMW in Witham – they offered me a good deal as I wanted quite a few extras, and it had already been announced that there was a new, water-cooled model was on the way. I like twins, and had never owned a Boxer before, so it was a bit different to what I’d normally have – at the time, I also owned a Moto Guzzi V7 Classic and a Kawasaki ER6n for scratching. I’ve just sold (and already miss) the ER6, but I became a big fan of KTMs, so after owning a 690 Duke for a while, I bought a 1290 SuperDuke too. The BMW is ideal for work when visiting shops incognito, and it keeps me warm, dry and clean for formal client meetings. Being a bit of a self-confessed ‘bike anorak’ I was also keen to see what it was like to live with a Telelever front-end… I can now say that it’s never been intrusive, and certainly manages to keep the whole plot well under control and very stable. 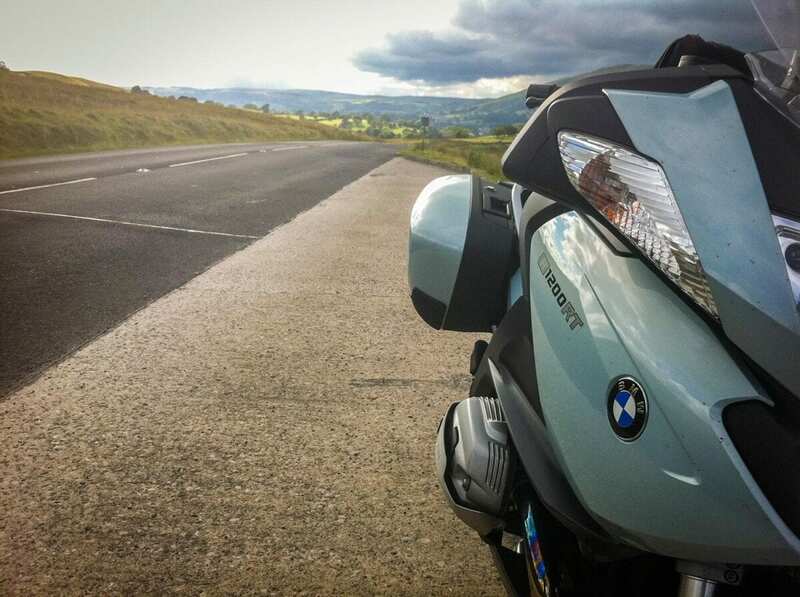 Interestingly, at the time I was deciding to try out the RT, BMW’s new K1600 six-cylinder bike had just become available, so I tried one of those too. The big six was manageable, nice and smooth, but not as flickable, and it didn’t feel as highly-developed and evolved (or funky) as the RT, so I decided to buy the relatively more nimble and slimmer twin. I use it most now for longer trips, as well as work. But it can be thrown around, as although it’s no lightweight, the mass feels like it’s carried low, and with wide bars and the suspension electrically adjustable to suit the terrain, the decent tyres can be fully enjoyed. The screen and fairing act like a visible ‘artificial horizon’ or angle-of-lean meter when the bike is cranked over – it’s a bit alarming at first, when you’re more used to naked bikes, but once you acclimatise it’s fine. 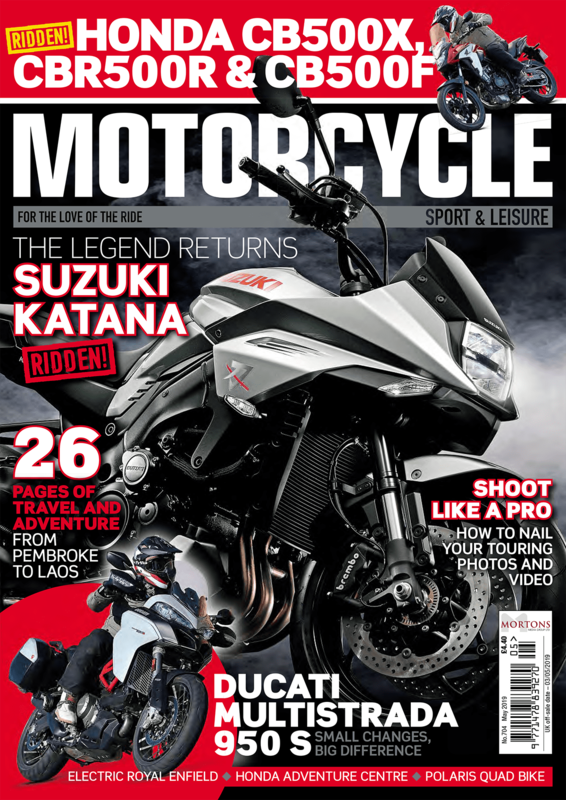 I have taken a pillion out on the RT, and its ideally suited, particularly as the suspension can be so easily configured for two-up riding by just pressing buttons on the handlebars and dash. It’s very comfy for the passenger, thanks to the heated seat and well-placed grab-handles and footpegs. Two up, it sits stable on the road, and that flexible, torquey engine suits the smoother riding style that pillions prefer. The last bike I had insured to take a pillion though was the ER6; it would have increased the insurance costs to be able to take a passenger on the RT, but cost no extra to have this option for the Kawasaki. 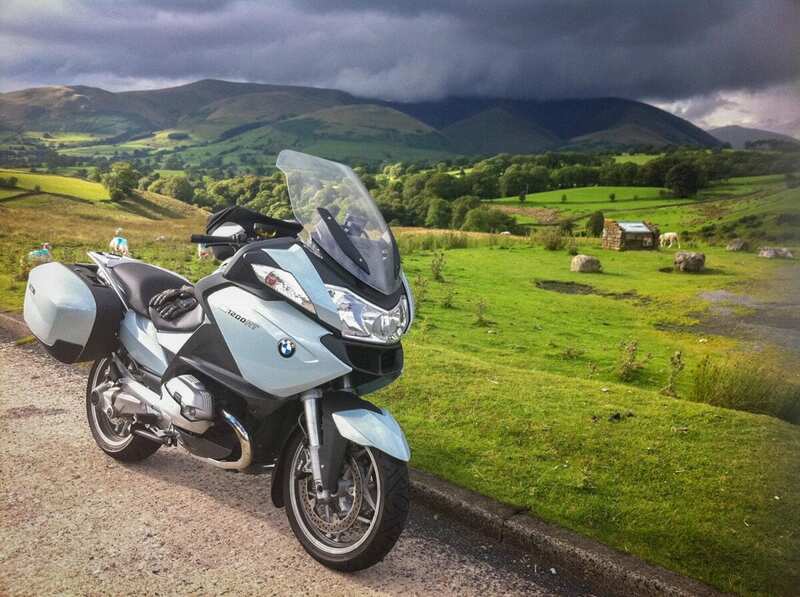 I did point out to the insurer that the big BMW was very much a pillion bike, but my comments fell on deaf ears! I don’t have much spare time, so my annual mileage – shared across all my bikes – has dropped to around 6000 lately. Though I do have plans to increase this. Long trips are where the BMW really shines, thanks to its effortless luggage-carrying capacity. 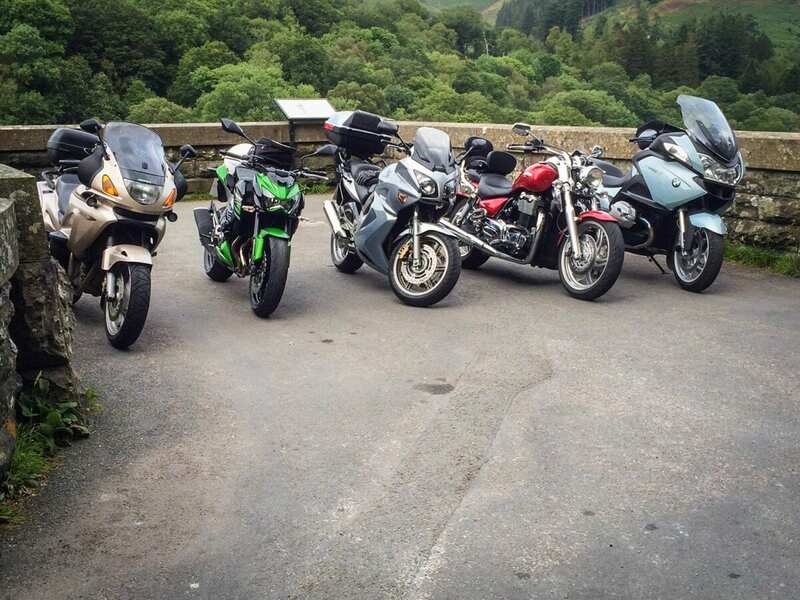 Riding all around Wales, the North and the Isle of Man, it shows how well the luggage is integrated into the design, as it has such a minimal effect on the handling. The weather protection and headlights are excellent, and while the engine is revvy if you want it to be, it’s got bags of flexible power low down. This combines well with the upright riding position and wide bars, comfy heated seat, and generous leg-room for day long comfort. There’s also a decent sized and lockable cubby-hole up front on one side of the tank – great for wallet, phone, keys and other things to which you need frequent access with some security. The electrically-powered movable screen is always useful, as you can position it to suit the speed and level of wind-blast that you want. I normally ride un-faired bikes, and am often too hot behind the big fairing. Opening my visor and adjusting the screen gives just the right amount of fresh cooling air, without any insects. The mirrors take a bit of getting used to, being quite low, but as such don’t get blocked by my elbows. The shaft drive is, of course, brilliant, as is the cruise control, especially in helping me keep my licence on 50mph sections of motorway. The clutch is easily the most gentle and progressive I’ve ever encountered – it has a very gradual engagement over a very long throw. This makes hill starts, U-turns, and general slow riding so much less of a problem. When brand-new, it did give off a slight burning smell, even on gentle use, but I’m told this is normal. It is a bit heavy to move around the garage, and you’re supposed to use 98 RON petrol, but when that’s not available it seems to run just fine on 95 RON. 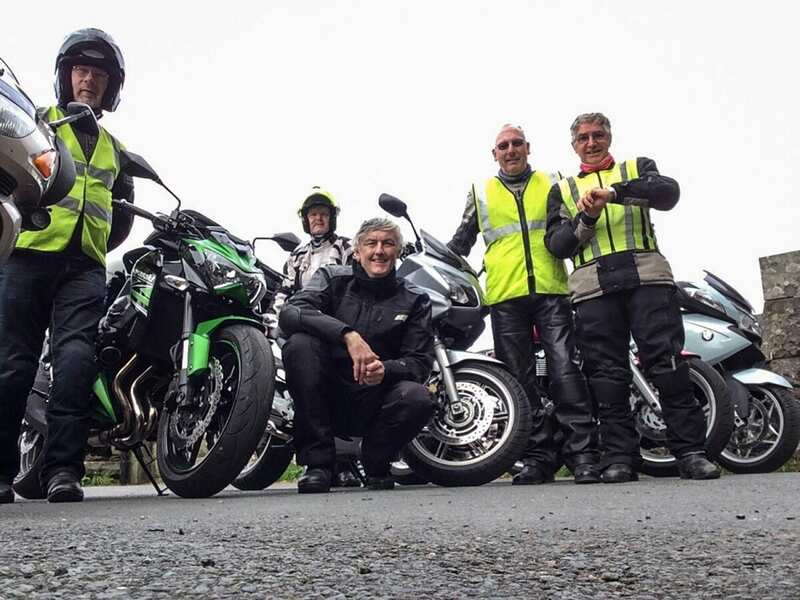 I really didn’t like the standard Bridgestone tyres that the bike came with – they didn’t have the feel I would have liked, and didn’t inspire confidence. At about 6000 miles, and well before really needed, I changed them for Michelin Pilot Road 4s. This was a transformation, and I was much happier with the way it felt in both the wet and dry. Like so many bikes, the front mudguard was lacking length to protect the engine, so I added a ‘fender extender’. It’s also got clear protective skins over the pannier paintwork to protect from those black streaks that sometimes get left when you rub them with your boot. The cylinder heads also have partial metal covers to protect against any bumps. BMW changed the left bar switch unit under warranty, just as I was beginning to have a few niggles with it – apparently it was a recall standard-service change anyway. Oh, and I couldn’t get a petrol station air line on the standard tyre valves, so got them changed for 90° ones. I’ve no plans to change it – I considered the R1200RS, and the new KTM SuperDuke GT, but neither are committed enough tourers for me.